Yesterday we had a look at some of the games that are going to be made available on the Nintendo Switch by Nintendo itself. Today we're looking at the other three Switch games that I was able to get some hands-on time with: Arms, Snipperclips, and that new Zelda game. This is the game that should have been the showcase for the Switch instead of 1-2 Switch. Arms was an absolute surprise (and marvel) in how it handled. I had to hold the Joy-Cons in my hands where the thumb-sticks faced each other, and the two trigger buttons accessible for my thumbs. This took a small period of time to get accustomed to, as in my thirty years of playing games, I’ve never held a controller in that way, ever. After getting used to it however, I instantly began wishing this is how the Wii Remotes worked on Wii Boxing ten years ago. Punching in-game is achieved by physically punching (the game tells you so! ), and tilting the Joy-Cons sends your character in that direction. It feels a little like the old SEGA arcade game, Virtual On, that required two joysticks for controls. Pressing one of the trigger buttons allows jumping, while another trigger is used to boost your character in the direction they are headed. Grabbing opponents is done by punching both fists at the same time, and curving your punch is achieved by tilting the Joy-Con after punching. There is also a special meter, that when activated, allows a character to send a flurry of punches their opponent’s way. All of the controls were rather responsive and the game did what I wanted it to. It’s a far cry from the waggle of Wii Boxing, that’s for sure. The aesthetic to the game reminded me of Overwatch. In particular, the character named Mechanica (a girl who pilots a large Mech like robot) looks like a direct cross between Tracer and Mei from Overwatch. Naturally, she instantly became my favourite. 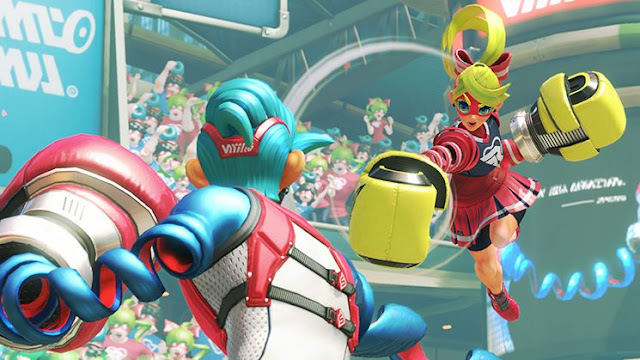 Arms appears to be marketed to people of all ages, and this is one I’d like to play again with some friends (and probably some beers!). Much like Arms, Snipperclips was a surprise hit. Barely even rating a mention in the Switch Preview video, Snipperclips may just well be the ultimate cooperative puzzler game. 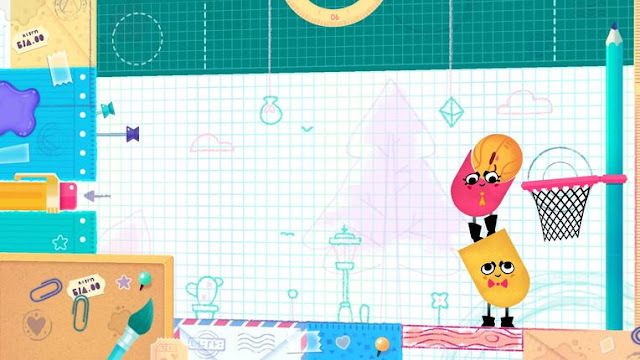 Snipperclips requires two people with a Joy-Con each to solve a variety of puzzles where the main ability of the characters is to snip pieces of each other away to change their shape. In order to do this, the characters need to overlap each other. If say, the person controlling the yellow character presses the A button, it removes what overlap there is from the pink character, and vice versa. The ability to rotate the characters means that unique shapes can be created for different purposes. My partner turned me into a thin, flat shape at one point so that I could balance a basketball to take to a hoop. I had to turn my partner into a bowl shape so he could carry a pencil before inserting it into a pencil sharpener. It’s really bizarre. Other puzzles required snipping each other so that both characters fit perfectly within the shape made by a dotted line. If someone stuffs it up and needs to try again, a simple press of a button returns the character back to their original form. Even when we weren’t cooperating very well, we were having fun. Our characters looked absolutely dumb in a good way for the majority of the time spent on the title. It’s got a charm a little like LocoRoco, where you can’t help but smile while playing. While the requirement of two people to play the game may be a deal-breaker for some, the fact that the Switch comes with two Joy-Cons means that those with someone to play with can have a hoot playing Snipperclips. This one is slated for the eShop only. I purposefully left this one until last. Quite obviously the most hyped game for the Switch for some time now, we were able to play a twenty-minute demo of the title. I feel as though Breath of the Wild is perhaps the largest scale game that Nintendo has ever made. Initially, the scale of the game itself is shown pretty early on in the game. While it may not be as big as a world like Skyrim, the world appears huge, and from what I explored, has more going on in it. Link is exploring a world set 100 years after some disaster that hit the kingdom of Hyrule (where does it go in the timeline? Who knows???). This world also seems to have more technology than in previous Zelda games. Link gets equipped with a Sheikah tablet early on that seems to acts like an NFC reader on Sheikah pedestals. What Link doesn’t get to begin with is a weapon of any sort. I came across enemies before I was able to get a weapon, thankfully I was able to find an axe lodged in the trunk of a tree. I then used the axe to kill some Bokolblins, then I stole their clubs and used those. Not relying on Link’s trusty swords felt refreshing, as each weapon I tried operated in its own unique way. There will be a lot of combat options in this one. The dungeons seem to be getting a revamp too, as I was instructed by an old man that I needed to find some treasure at the bottom of a dungeon. The demo ran out before I was able to get the treasure, though the scope of the dungeon was a lot smaller than usual. A Nintendo rep was on-hand to tell me that there are a lot of these mini-dungeons to explore throughout the game. Link also gets Skyrim-like objectives. There are spots for main objectives and side quests, and these can be swapped at any time so that waypoints on the map represent the current chosen objective. Purists who want to play this in the same vein as the original Legend of Zelda can turn the objectives off completely and explore the world around them and discover the dungeons and treasures themselves. Half-way into the demo, I pulled the Switch away from the dock and played it in handheld mode. The size of the screen appeared to be big enough, and the resolution good enough to notice items on the ground. Those who want to play Zelda on their commute should have no issues in their play through by doing so. 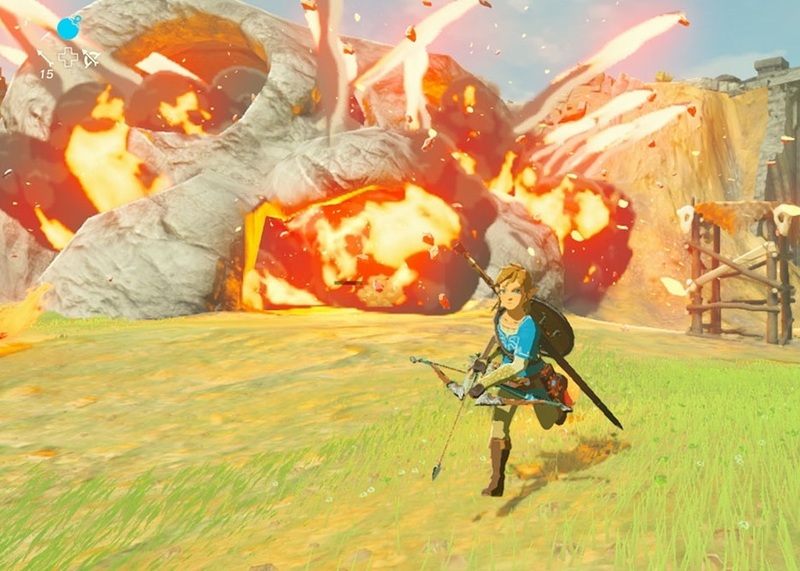 Breath of the Wild is a beast of a game, even in the opening 20 minutes. From the various trailers shown, it looks like a huge celebration of all the previous Zelda games rolled into one. 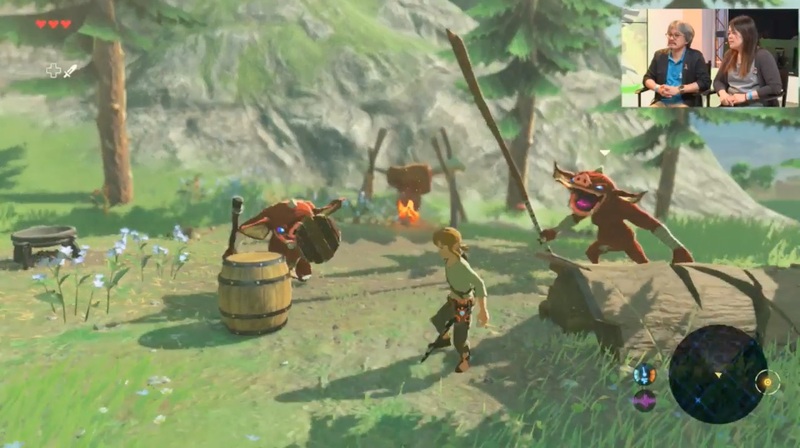 The addition of objectives and equipment will appeal to a lot of the Western market who are used to that kind of thing in their games, though at the same time Breath of the Wild doesn’t need to hold your hand the whole way through. This looks to be one of the biggest releases of 2017, so stay tuned!